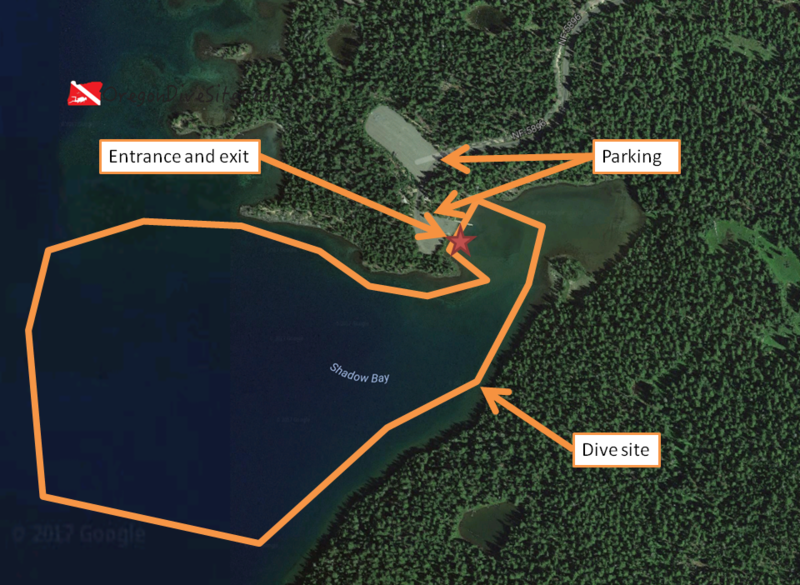 The Shadow Bay Day Use Area Boat Ramp on Waldo Lake is a fun and easy place to go diving on the lake. This is a big, clear body of water that has excellent visibility although at this particular site there isn’t that much to see. We like diving here with SCUBA friends to take photos of one another goofing around underwater. It is also neat to watch sailboats pass overhead on the surface from 50 feet down. Photo by Coulee at English Wikipedia (Own work) [Public domain], via Wikimedia Commons. Waldo Lake is a fun place to go diving because of the great visibility and easy diving conditions. The main thing we like about this dive site is the visibility. Aside from Clear Lake, there aren’t that many places in Oregon where you can go diving so easily and get such great viz. We like taking photos of each other underwater here and we also enjoy watching the hulls of sailboats glide past from the bottom. Oakridge, Oregon is down the highway by a half hour or so from Waldo Lake. Look for signs to Waldo Lake on Highway 58. National Forest Road 5897 is the road you want. Follow the road for a few miles until you reach National Forest Road 5896. There should be a Shadow Bay sign at the left turn. Follow signs for the boat ramp. Parking usually isn’t a problem at the boat ramp area. On really busy summer days, you may have to park over in the campground day use area. Imagery ©2017 Google, Map data ©2017 Google. Shadow Bay starts shallow but gets very deep when you exit the little bay by the boat ramp. The little bay next to the boat ramp is shallow. Depending on your inclination, you can start diving here or you can surface swim out to the deeper water. The larger part of the dive site can get very deep. We went as deep as 70 feet here before. It is important to use a compass and have good navigation skills because it is easy to get disoriented in the deeper water where there are no underwater landmarks. We usually walk right in at the boat ramp but you can also enter from the shore along the lake if you don’t mind a little bit of a scramble to get in. While we usually dive this site as a shore dive, you can also dive the entire lake as a boat dive. Recently the Forest Service has begun allowing electric motors on the lake after many years of banning all engines. Even with electric motors being allowed, most people still use sailboats here. Conditions here are usually good. There isn’t any current to speak of. Just watch for boat traffic when you surface. We suggest taking along a dive flag so that boats can spot and avoid you. We recommend the dive flag that we use on our Gear We Use page. Visibility is usually at least 40 feet and sometimes in excess of 100 feet. In the summer, water temperature around the boat ramp can be 65F. At greater depths, expect water temperatures around 40-45F. This site is only accessible in the summer and fall. Snow in the winter and spring blocks the road. We have not gone past 70 feet here although it appears you can easily go below the maximum recreational SCUBA diving depth limit on the western side of the Shadow Bay dive site. This lake is an altitude dive. Shadow Bay is at 5400 feet above sea level making it one of the higher lakes that you can dive in Oregon. Be sure to know what you’re doing with your altitude tables and be sure your computer compensates for altitude before diving here. Aside from the altitude diver training requirement, this dive site is very accessible to just-certified open water divers. This dive is very easy aside from needing to remember about altitude considerations. Depending on where you park and where you enter, you will walk between 50 and 500 feet. You don’t strictly need to surface swim here although swimming out of the little bay where the boat ramp is will conserve air for the deeper areas further to the west. You might want to surface swim about 300 feet. Remember that this is an altitude dive. The bottom on the western side of the site slowly drops deeper and deeper. Watch your gauges and your depth. It is very easy to be lured deeper than you intended to go because there aren’t any visual cues. The closest dive shops are in Eugene and Bend. This site is in the middle of nowhere and you need to be self sufficient to dive here. There aren’t any restaurants nearby. Bring your own food! There are many National Forest campgrounds and many opportunities for primitive camping in the area.